Artwork Panel: 49.9cm x 96cm ≈ 19½" x 37¾"
Silk/Brocade: 58.8cm x 151.7cm ≈ 23" x 59¾"
Reason for discount: Very minor spots in painting. The title of this artwork is 浩氣長存. It means vast spirit or nobility of spirit forever. 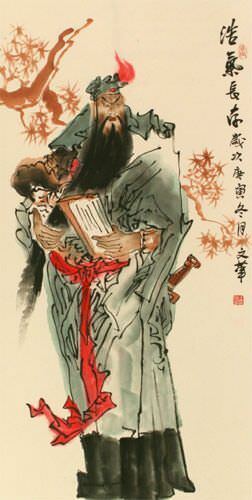 It refers to this famous warrior saint named Guan Gong (also known as Guan Yu).